Ok, so i'll admit it once more. 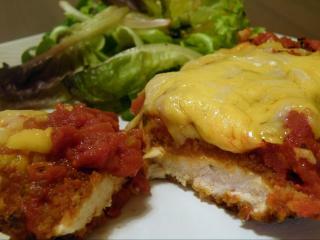 This amazing Chicken Parmigiana recipe unfortunately, is not one of our recipes. Yes, thats right, it's stolen! But before you fall of your chair I wll just tell you we have done it for a reason. See we could have put up our favorite recipe, which I tell you now, is not bad at all but then we decied that that enthusiastic chubby English man could do it better. So all credit goes to Jamie Oliver on this one, congratulations expensive chef, you've got one over on us this time. (Your Chicken and Dumplings recipes is rubbish though! It's not a patch on ours!) Considering that we are stealing his recipe we thought it only fair ot put a link to his site. So just click here if you fancy Jamie Oliver. We'd rather you didn't though, we quite like you being here actually. 1. Heat the 2 tbsp of olive oil in a saucepan. Add the garlic and gently cook for 2 minutes. 2. Empty the can of chopped tomatoes into the pan and the oregano. Season and stir. Cook over a low/medium heat for 20-25 minutes until sauce is thick. 3. Meanwhile, coat the pieces of chicken in flour, shaking off any excess. Next dip into the egg, and then finally dip into the breadcrumbs, ensuring the chicken is evenly covered. 4. Preheat the oven to 200C.5. Heat enough olive oil for shallow frying in a frying pan. Fry the chicken on both sides until golden. 6. Place the chicken in a roasting tray and pour over the tomato sauce. Sprinkle over the grated cheeses and place in the middle of the oven. Bake until the cheeses have melted and the chicken is cooked through, about 10-15 mins. 7. Serve with mixed salad leaves, tossed in a little vinagrette.